Are you looking to exercise all year round? Do you want something easy, accessible and enjoyable? 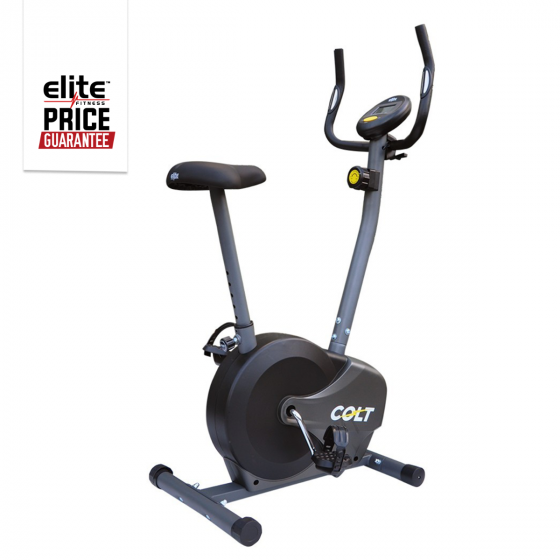 Try the Elite Colt Exercycle for a great low impact cardio workout for an indoor cycling session. The compact design of the Elite Colt Exercycle allows it to fit into any garage, lounge or home gym with ease, making it the perfect piece of equipment to have in your household. 8 levels of magnetic resistance are designed to challenge your endurance whilst the heavy precision flywheel provides an extremely smooth and quiet ride. The Elite Colt LCD Console offers valuable workout statistics on Time, Speed, Distance, Calories burned and Heart Rate, keeping you focused and motivated to achieve new workout goals. Pulse sensors are conveniently located on the handle bars to measure heart rate comfortably. The Colt has been engineered with high quality parts at an affordable price, making it the ideal exercycle for beginners.